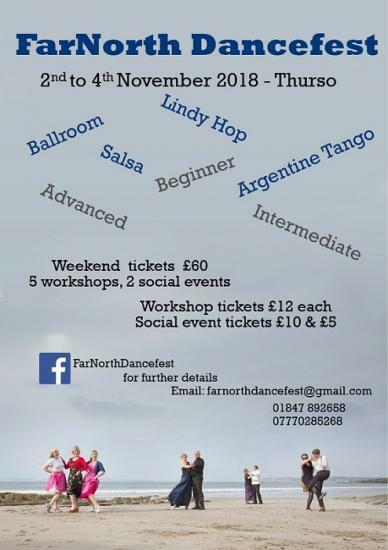 On the 2nd to the 4th of November 2018, Thurso Come Dancing are hosting the first ever "FarNorth Dancefest". We are bringing 4 teachers from the Inverness area to 4 venues in Thurso to run simultaneous workshops for a weekend extravaganza. They will be teaching fun routines at varying levels in their own dance styles - Latin, Ballroom and Sequence dancing with Caroline Coomber from Elgin, Salsa with Cuban Passion in the Highlands, Argentine Tango with TangoNess and Lindy Hop and Charleston with Highland Swing. Tickets are available at £60 for a weekend pass which gives you up to 5 workshops plus the Opening and Finale Event tickets or £12 per single Workshop. The Social Events are priced at £10 on the Friday and £5 on the Sunday. The Charity evening on the Saturday is £7.50 on the door but if you buy in advance it is only £5. You can purchase any tickets through our facebook page FarNorth Dancefest or by getting in touch with us on farnorthdancefest@gmail.com or phone Lesley on 01847 892658. The local teachers who cover these dance styles here in Caithness are on board and looking forward to joining the classes as there is always something to learn! The weekend is not all about learning though, as we have Social Events on all 3 evenings too. Friday is our Opening/Registration Event in the Legion with an Inverness Ballroom and Latin dance band called Dancing with the Sharks. These musicians have connections to Caithness and have played in the past with our own Ian Sinclair. Ian's band Barracuda Boogie Band will be finishing our weekend in the Finale Event with a Live Jive style dance in the Park Hotel playing all types of music. Saturday evening sees our local Caithness Big Band playing their "Night to Remember" which is an annual Charity event in the Weigh Inn. These events are open to everyone though - dancers, non-dancers and music lovers alike, whether local or visiting, just pay at the door. We also hope to run Fringe events around the time of the festival. Thurso, Come Dancing will be holding free taster classes on the 30th of October and the 1st, 6th and 8th of November. We hope to encourage other dance classes to do the same to advertise what they do and get everyone in Caithness (and maybe Sutherland) moving. Dance is a very sociable exercise and you may have seen recent press articles saying that it is a good way to fend off dementia as your brain is training all the time your feet are.